3" x 3/4" x 3/4"
Human interaction with nature and our temporal existence is a topic that artist have explored for centuries. Our desire to control the uncontrollable through scientific systems of identification and theoretical explanation lies at the core of our current worldview. The separation of humans through a society based in technology and science from nature and the ecosystems we inhabit creates a fascinating yet troubling split. Understanding and being a part of this disjointed worldview is at the center of many of my bodies of work. The Herbarium Specimen rings reference the human desire to label and collect all aspects of our surroundings. 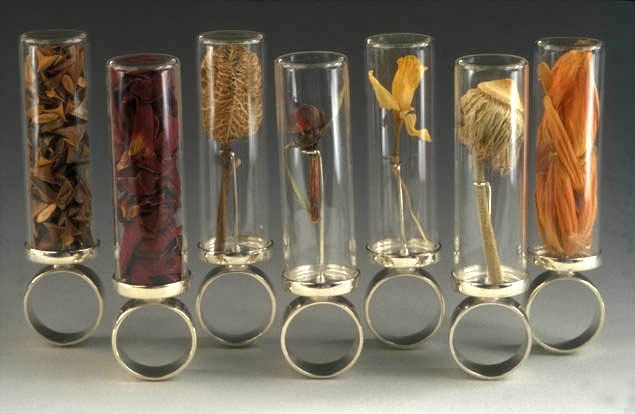 The rings are portable specimens on display in contained scientific specimen jars. The specimens are carefully collected from my garden and thoroughly research, their scientific name identified and written on the bottom of each ring.